NEW YORK (AP) -- Stocks rose sharply on Wall Street Wednesday, pushing the Standard & Poor's 500 index to an all-time high. Technology stocks, which have lagged the broader market this year, surged after network communication company Adtran reported earnings that were double what Wall Street analysts expected. That's helping boost optimism that spending by businesses on technology equipment will increase. Chipmakers Micron and Intel jumped, as did other network equipment makers like Cisco and JDS Uniphase. The S&P 500 climbed as high as 1,588 in the afternoon, beating the high of 1,576 it set during the day on Oct. 11, 2007. Technology stocks led the way higher with an increase of 1.8 percent. The group is up just 4.7 percent this year, trailing the S&P's gain of 11.4 percent. The stock market is reversing course from last week, when investors' confidence took a blow from an unexpectedly poor report on the U.S. job market and other signs that the U.S. economy slowed in March. The Dow Jones industrial average jumped 125 points to 14,799 and is on track for its third straight gain and its biggest one-day rise in six weeks. The Dow surged in the first three months of the year and is still up 13.1 percent so far in 2013. The Nasdaq composite, which is heavily weighted with technology stocks, had the biggest percentage gain of the three main indexes Wednesday, rising 51 points, or 1.6 percent, to 3,288. The S&P rose 16 points, or 1 percent, to 1,585. Bond yields fell as investors moved money out of safe haven U.S. government debt and into riskier assets. The yield on the 10-year Treasury note rose to 1.80 percent from 1.75 percent late Tuesday. Chipmaker Intel logged the biggest percentage gain in the 30-member Dow index, rising 62 cents, or 2.8 percent, to $22.36. Cisco Systems rose 55 cents to $21.52 and Microsoft gained 60 cents to $30.21. Cameron Hinds, regional chief investment officer at Wells Fargo Private Bank based in Nebraska, said rising house prices, coupled with a strong stock market, are creating a virtuous circle for consumers and is bolstering investors' confidence. "We are starting to develop what I would call a positive confidence loop," Hinds said. "Last year we were lacking in confidence." The Federal Reserve released the minutes of its March policy meeting ahead of schedule Wednesday morning. The minutes indicated that some Fed members wanted to end the bank's stimulus program relatively soon, saying the costs likely outweigh the benefits. The Fed's stimulus program has been one of the key factors driving stocks higher this year. Investors may welcome signs that the economy is recovering well enough that it may no longer need support from the Fed, said Brian Gendreau, a market strategist at Cetera Financial Group. "The idea that the Fed thinks that we are closer to the restoration of normality might be positive for the market," said Gendreau. Hospital management stocks fell heavily after Deutsche Bank lowered its recommendation on the companies because their prices have risen so much that they no longer offer good value. Private hospitals have surged over the past year in anticipation that health care spending will increase following the introduction of the Patient Protection & Affordable Care Act. Health Management Associates plunged $2.13, or 17 percent, to $10.47. Tenet Healthcare fell $2.35 to $41.17 and Community Health Systems dropped $1.74 to $42.17. 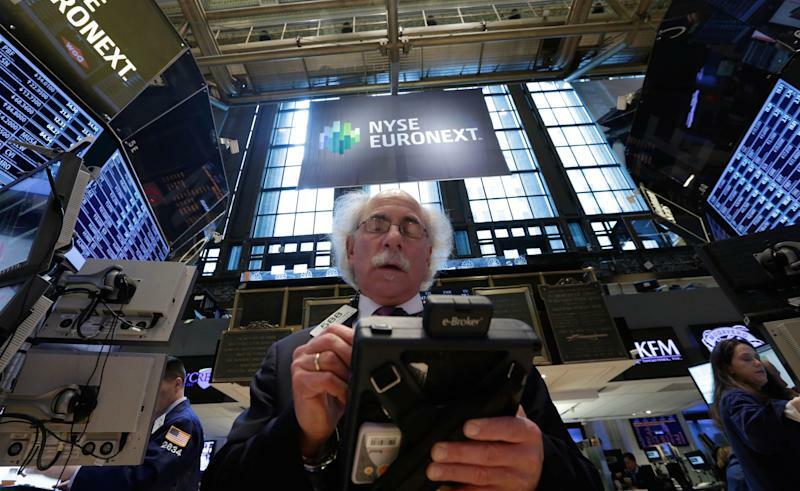 European markets also rose broadly. Benchmark indexes were up 3 percent in Italy, 3.4 percent in Spain, 2 percent in France and 2.3 percent in Germany. Yields fell on the government bonds of Italy and Spain, which means investors are more confident in the finances of those countries.